Up Late returns for a one-off special event over summer! Surrounded by GOMA’s summer exhibitions, Summer Up Late will feature DJs, bars, a sensory tour, and live music from acclaimed Michigan-born, Berlin-based electronic producer and performer Laurel Halo, and independent Sydney-based producer and songwriter Lupa J. 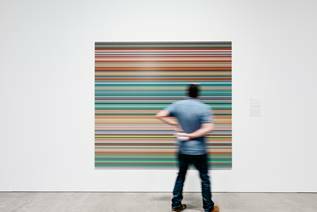 Summer Up Late tickets include exhibition entry to both of GOMA’s major summer exhibitions ‘Gerhard Richter: The Life of Images’ and ‘Yayoi Kusama: Life is the Heart of a Rainbow’. Lupa J: Known for her soft yet commanding vocals layered over moody electronic beats, Lupa J has attracted international attention since her first release when she was only 15 years old. After being nominated as a finalist in the Triple J Unearthed High competition for two consecutive years, Lupa J’s profile has continued to rise. Lupa J is currently celebrating the release of her third EP A House I Don’t Remember (2017). Laurel Halo: Blending her Mid-West techno roots with sounds of her adopted home in Berlin, Laurel Halo creates ambient and genre-defying tracks. Her 2012 debut album Quarantine received rave reviews, climbing the charts to reach #10 on the Album of the Year list in the Washington Post, and received Album of the Year in Wire Magazine. Her most recent release Dust (2017) has been heralded as ‘powerful, consuming, yet also strangely comforting’ by the Guardian. DJ Black Amex plays a mix of disco, house, soul, funk and rarities. She is determined to make you groove to classic and modern tunes. She can be found on the weekend at residences at Black Bear Lodge, Barbara and The Foundry. Sharpen your sensory powers on a tour led by Dr Nadine Cameron, academic, writer, wellbeing consultant and member of faculty at The School of Life. Drawing on work within the ‘Yayoi Kusama’ and ‘Gerhard Richter’ exhibitions, you’ll contemplate each of the senses from psychological, sociological and neuroscientific perspectives. Auslan interpreted. polka-dotted inflatable work titled Dots Obsession 2017. ‘obliterate’ an all-white domestic space with bright, colourful dot stickers. world including Richter’s own personal archive.